Even as The Walking Dead erases race it has no problems having Father Gabriel, a one time coward and pastor extol the virtues of Rick. 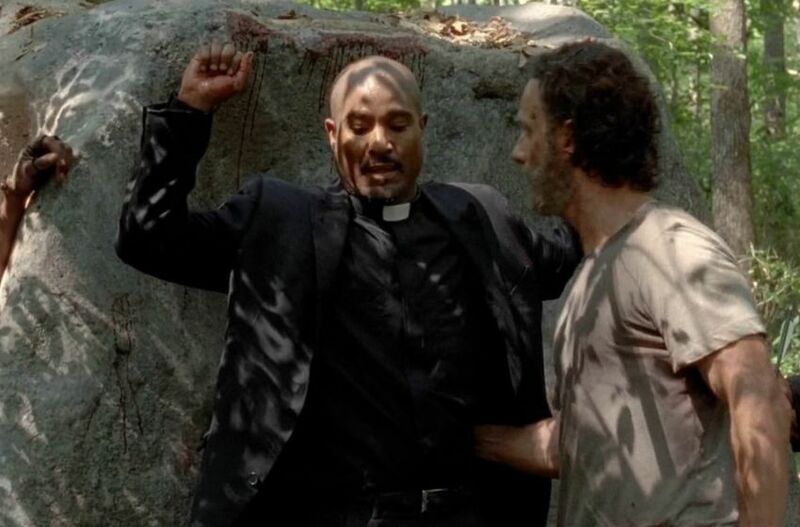 In New Best Friends, Father Gabriel even went as far as to claim that Rick can do anything. Even though this scene was set in a junkyard, for all of the racial implications at play, it might as well have been set in antebellum south during the heart of slavery in front of the big house. What did Rick do to earn such high praise? He simply didn't kill Gabriel when he had the chance. Gabriel’s job is is to extol the virtues of White, straight cis able bodied hyper masculinity and die at the altar of it if necessary. Gabriel has elevated Rick to God like status, incapable of harm, benign to the righteous and swift in his might revenge. Akin to the burning bush, Rick makes pronouncements and provides hope to the downtrodden as long as they conform to his commandments. There is never any doubt that when Rick finally confronts Jadis, the leader of the new group, that he will emerge victorious. So sure is Rick of his victory that he smiles when he finds himself outnumbered and surrounded. Rick claims that Gabriel taught him that enemies can become friends to explain the arrogance of smiling in that moment. Rick can afford to smile because as the protagonist he has plot armour, but what is perhaps more insidious is the fact that said armour exists to prop up his leadership. For much of the season to date we have seen Rick humbled by one more powerful than him. Rick has been forced to cast his eyes downward. He’s had to beg and cry and work in the service of another. Rick has been humbled. But look at the tone - when Rick is humbled, he is the leader, the mighty one, brought low. It is a set back on his road, our hero is on his knees - but we all know he rise up again to his rightful place; we know this is just a stepping stone on his road to triumph. But Father Gabriel himself has been repeatedly humbled - by Rick, by Carol - he has been shamed, degraded, properly chastised: but this humbling was never about him rising up after a set-back or learning and growing. Instead we had Father Gabriel Learning His Place. This wasn’t about him growing, it was about him shrinking appropriately into his lord’s shadow. We see this again and again with Rick whose humbling could not be allowed to continue. Beating Negan isn’t just about getting out from underneath an oppressive cruel man but Rick bolstering his fractured ego. This, of course, must be accomplished by Black fluffers before the deed can be accomplished. Much of Michonne’s characterisation has been silent. She’s been the one ready to pull out her sword and fight. Michonne has been Rick’s weapon to pull out when necessary. We have rarely seen Michonne smile or engage in any kind of lengthy conversation. Many in fandom went into absolute squeals of delight when Richonne became a thing. And why not? Michonne is a fan favourite from the comics and with Andrea dead on the show, there’s no real reason not to fill her spot with Michonne. It seems like a natural fit and an easy way to pander to the fans. Such a partnering however is not without its problematic elements because once again, it serves the larger narrative of uplifting Rick. In the comics, Andrea remained a vital member of the team just as Michonne is today. As part of a couple, Andrea worked hard to provide reassurance for Rick in moments of self doubt just as Michonne is today. Unlike Michonne, Andrea was never simply a silent weapon and so now, when we see Michonne speaking in multiple sentences at a time for the first time since entering the show, it’s to provide support for Rick. This pairing doesn’t create equality, nor does it uplift Michonne because it makes her Rick’s personal cheerleading section. Let me say that again for clarity. Michonne didn’t start to have extended speech on The Walking Dead until she started reassuring Rick. Pause for a moment and consider the racial implications and how problematic this is. But none of this can be more glaring than Tyrese. Because Tyrese of the comics was competition. Tyrese of the comics was a peer. Tyrese of the comics was a man who thoroughly deserved to stand alongside Rick. While Tyrese of the TV series was introduced far far later, achieved very little, spent more time looking after a baby than leading adults and was casually and cruelly killed off for no good reason. Tyrese wasn’t just not allowed to be Rick’s co-leader; he wasn’t even allowed close, we weren’t ever allowed to even briefly see him in that role despite it being well established in the comics. All of this comes from a TV series that has already caused us to write so many posts about race (and that’s just the direct posts, not those general posts about race that use The Walking Dead as an example): from the blatant tokenism to disposability to serving as little more than background decoration, The Walking Dead has always had a problem with race and a fanpoodling Gabriel only rubs salt into the wound.